Steel hardening consists of heating the material to a temperature over 723ºC (austenitic temperature) and then cooling the steel quickly, often with a quench of industrial water. The aim of this induction heating application is to transform the structure of the steel in order to increase its hardness, its yield strength,and its breaking tension. The steels that are normally hardened with induction heating contain from 0.3% to 0.7% carbon. One of the advantages of induction heating is that it can be directed to specific areas of the part with great accuracy. Most hardening operations treat the outer part surface. The degree of hardening is controlled by varying the power applied, the frequency of the inductor current and the heating and cooling times. The treatment can be done in two different ways: either static or progressive (by scanning). Static hardening consists of setting the part in front of the inductor and carrying out the operation without moving either the part or the inductor. This type of operation is very fast, requires only simple mechanics, and delivers highly accurate heating, even with oddly-shaped parts. The scanning treatment consists applying heat to the part with a continuous operation, by moving either the part or the inductor. With progressive scanning, relatively larger surface areas can be hardening with lower power. Most crankshafts are manufactured in cast steel; some high-end crankshafts are produced with forged steel. Hardening crankshafts involves consideration of 4 different heating zones - pins, journals, flanges, and shaft - with unique characteristics. The heating time for each zone depends on the material used. Induction heating is frequently used for hardening industrial gears, rings and bearings. The speed, consistency, flexibility and accuracy that induction heating offers helps manufacturers optimize capital expenditures, increase production options, improve hardening quality, and maximize energy efficiency. 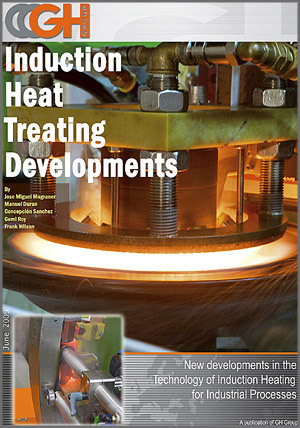 Download "Induction Heat Treating Developments"